SERVICES OF THE HOSTEL "GELTOKIA"
"Geltokia" is a hostel for pilgrims doing the Saint James way. 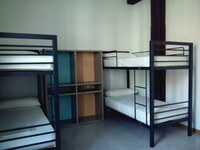 There are four different shared rooms of 8, 12, 16 and 20 people; 56 beds in total. 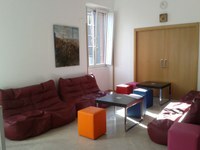 The hostel has a living room, WI-FI, bathrooms and a laundry with a washing-machine and a dryer. 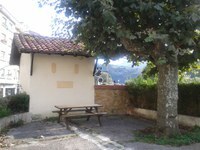 It has not got any kitchen, but it has a beautiful terrace. It is managed by the volunteers of the Association of Deba and if you want to stay there, you have to register and ask for the key in the tourist office by showing the credential. 5 € are requested by the association for maintenance costs. The Friends of the Ways to Santiago of Deba is a nonprofit association with legal personality. It was registered in the Register of Associations of the Basque Country in June 2004 with the number AS / G11251-2004. Although the main stretch of the old Jacobean road runs through the old neighbourhoods of Sasiola and Astigarribia, the current preference is Deba-Calvario-Apain. Between Deba and Markina-Xemein there are no villages and we only come across the small rural village of Olatz (km 6,9) where there are various restaurants. The route crosses a hilly area which is slightly more difficult than Zumaia-Deba. It goes from sea level in Deba up to a height of 485 metres and then down to 94 metres in Markina-Xemein. You have to be very careful with the signs in order to follow the right path because there are many crossroads. You can download the track Deba-MarkinaGPS to see how to follow the way. km0: Deba. Leave town via the walkway along the Deba River to the footbridge. On the other side of the footbridge, cross the road at the zebra crossing and begin the uphill climb along the dirt track to the left. Follow the red and white Talaia GR waymarkers toward the neighbourhood of Laranga. After passing a horse ranch, you'll reach a crossroads where the GR continues straight to Mutriku. The Way of St James, however, goes to the left toward the Calvario hermitage. km 3,6: Calvario. After enjoying a drink of cool water at the fountain beside the hermitage, head downhill past a grill house toward the GI-3230 road. Use caution to cross the road and head to the fronton court. 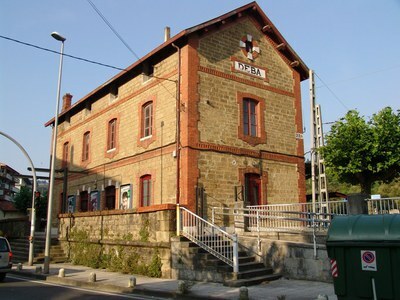 Located right next to the fronton is a privately-owned pilgrim's hostel. Continue along the dirt track. After a sharp curve you'll pass through an oak grove along an old road leading to a crossroads with a signpost for Aparain. From here, follow the sign to the right to the village of Olatz, where you'll find a tavern. You're now passing through the Basque Coast Geopark and one of the best examples of karst land formation. km 6,9: Olatz. Leave the hermitage of Olatz behind. Turn right onto a concrete track, and follow it for one kilometre before turning left onto another track. This begins a long uphill stretch to the Gorostola farmhouse. At the farmhouse, take the forest track to the left toward another farmhouse called Arnoate. km 12,5: Arnoate. Before continuing to the right toward Markina, next to this sprawing farmhouse you'll see an old fountain and lavoir, once used to wash clothes. This is a good place to rest your feet and fill your water bottle. The track leading to Markina goes through forest and past a number of farmhouses. The steep downhill stretch at the end will test your thigh muscles and you'll be happy to see the football pitch at the bottom. Continue past the Barroeta tower on your left until you see the hermitage of San Miguel in Arretxinaga. km 23,4: Arretxinaga. The door to the hermitage is on the other side of the road and it is usually open. After the hermitage, you'll see a footbridge next to a cattle trail yard, where huge stones are dragged by oxen at festival competitions. Some pilgrims take a quick detour across the bridge into town. But it's worth it to stay on the official path, which follows the Urko River to the impressive church and neoclassical cemetery of Xemein. km 24,2: Markina-Xemein. There is no official tourism office in Markina, but just before reaching the centre of town, you'll see a cultural centre called Kulturgunea Uhagon on your left. Here you'll find a cafe and information about cultural events and anything else you might need. Markina Xemein - Ziortza Bolibar (Cenarruza church) 6,2 km. From Markina-Xemein, the road to Ziortza-Bolibar is more comfortable. Taking the road towards Bilbao, about 600 metres after the last houses we see on the right the Gothic Hermitage of Erdotza. 60 metres afterwards we take the right following the indicated route until we get to Ziortza-Bolibar. Next to the church we take the paved path which after 1.5 km takes us to the Collegiate Church (Colegiata), which is the end of this stage. In Ziortza-Bolibar, next to the Church (Colegiata), we can´t find accommodation. It is however advisable to contact the Tourist Office of Deba in advance. Cycling Pilgrims: Pilgrims on mountain bikes have to go from Deba to Mutriku along the GI-638 road. At the end of this town we take the road on the left to Olatz along a small local road. In Olatz we join the indicated route and follow it to Markina-Xemein; from here we take the road to Ziortza-Bolibar and then to Cenarruza Church along the indicated route. The route largely follows the old 14th and 15th Century roads. Take the paved path signposted Getaria 150 m from Zarautz parish church on the road to Meagas. This is a steep path up to Santa Barbara hermitage. Following the signs go left and head up to the Askizu neighbourhood and then to Zumaia (km 9.3). Passing through the town's old quarter the road then goes up towards the cemetery and then on to the small neighbourhood of Elorriaga (Deba) and then to Itziar town centre (km 18). Itziar has accommodation, food shop and restaurants. Between kilometres 16 and 21 there is also the possibility of finding accommodation in rural tourism establishments. From Elorriaga to Deba there is also another path which, although it is more difficult, does offer significant geological value and incredible scenery. It runs along the cliff next to the sea, and it is an area declared Protected Biotope and goes from the GR-121 indicated in red and white. From Itziar, the last stretch of this stage and also the easiest, the path goes to Deba rejoining the sea. Deba has all kinds of services although it is advisable to contact the Tourist Office in advance. You should walk along the indicated path and not on the road as it is more dangerous and 2 km longer. Cycling Pilgrims: Pilgrims on mountain bikes have to go from Zarautz to Getaria on the N-634, and 1 km later take the Askizu road on the left. Between Zumaia and Itziar you should use the N-634. Between Itziar and Deba take the indicated downhill concrete paht. Those on racing bikes must always use the N-634. Only for pilgrims who come on foot, on horse or by bike. Pilgrims who come on foot have the priority. Those who come by bike can enter to the hostel at 18:00 (if there is still place). It's compulsory to show your credential. You are allowed to stay just one night. It's not allowed to get into the hostel before 13 o'clock. It's not allowed to drink or eat. It's not allowed to smoke inside the hostel. 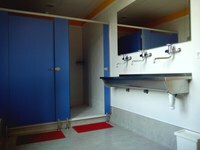 Hot water comes from an electrical heater, so do not stay for a long time in the shower, because it may happen that people who come after you do not have enough hot water . After using the shower, please dry the floor, perhaps some water has been dropped outside the shower. The people who are in charge are not permanently there. If you need something, address to the Tourist Office. We will give you a key for your personal use. Please do not give it to anyone. When you leave the hostel, do not forget to put it into the box next to the door. Take care of the installations; leave them as you would like to find them. If you mess something please clean it. Animals are not allowed inside the hostel, except guide dogs. The bikes can't be inside the hostel. There is a room for them, ask the key to the responsable. After 10:30 p.m. please keep silence. Other pilgrims want to rest. The people who are in charge are volunteers. Please, try to make things easy for them. You must leave the place before 8:30 a.m.
Groups: pilgrims who do the way individually will always have priority. Groups will not be able to book a bed in the Geltokia hostel until 7 p.m.
Minors : Each minor will need to be with an adult to sleep at the Geltokia hostel, except families.